Meet Franklin. He’s our 2.5 year old bulldog-boxer mix. We adopted him 1.5 years ago from the Animal Welfare Rescue League of Alexandria. It was one of the best decisions we’ve ever made. He is so completely awesome and adorable. Franklin currently goes to doggie-daycare. Picture a gigantic building with a massive room that has some kids toy jungle gyms (slides/houses), plenty of fresh water, air conditioning, and a couple people to play with…. then add in a mandatory nap time every day from 12-2PM. Ruff (pun intended), right? As much as we love Franklin to be at daycare and as much as daycare has helped to socialize him, we’re not made of money… so, we decided that we wanted to install a dog door so he could go outside in the back fenced yard/patio area and get down into the basement where it’s nice and cool. You might be thinking, what about crating him? Tried that. 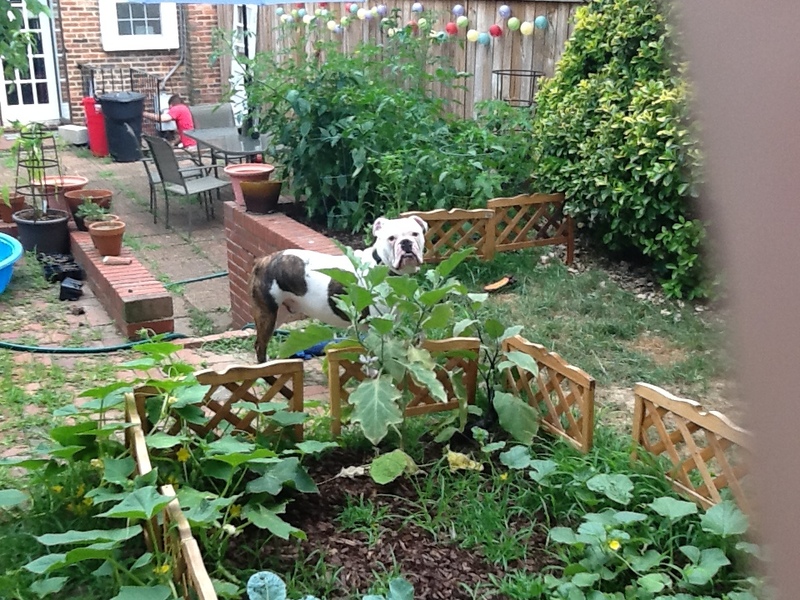 Franklin suffers from severe separation anxiety… especially in a crate. He scratches and paws, gets worked up, and ends up hurting himself. We have rescue remedy, he is on benadryl for allergies, and we have a thunder shirt. While all of these help, they are not the best solution. Plus, if we have a tall-fenced back area, why shouldn’t he be able to hang out there and still have access to some place cool? We are currently renting, so we obviously couldn’t just saw a hole in the basement door. Instead, we took to the roads! We drove out to a Re-Store. It’s one of those Habitat for Humanity stores. They sell all sorts of “house parts” from toilets to shelves to screws to tools to doors. We priced out brand new doors but they were way to expensive just to cut up. We lucked out- out of the many many doors at this particular Re-Store, there was one that was the perfect measurement; it had glass windows up top too! AND it was only $15! Best purchase yet. Andrew with the $15 Door! We bought the dog door (and jig saw and corded drill from Lowe’s). I think total it was about $150. We didn’t get the best of the saws or the best of the drills, but they were still good brands and would be perfect for our odds and ends type work. After taking the original basement door off the hinges, we were trying to figure out how to line up the new door perfectly with the hinges that were currently on the door frame. 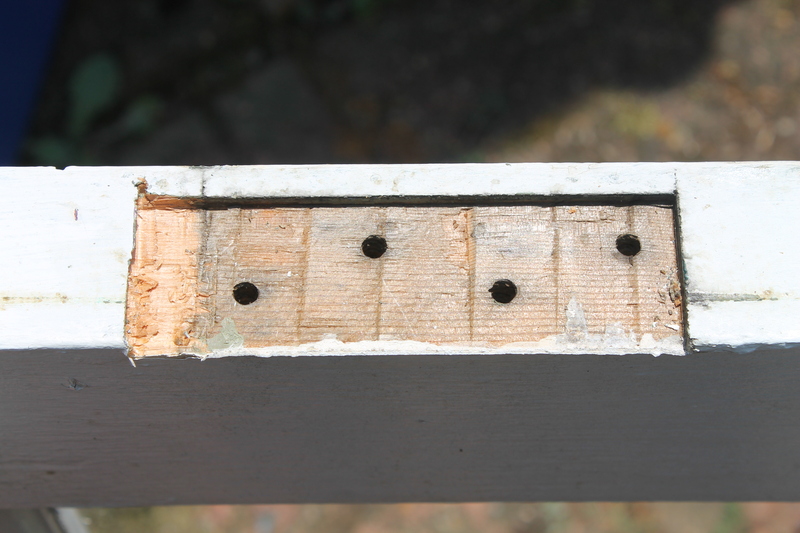 We measured where the hinges were in relation to the frame and then again measured where those hinges should lie on the new door… then we used a chisel to chisel out the extra wood that needed to be removed. We also used the template and directions in the dog door box to install the dog door. Like many of these “all in one box, put it together” deals, the directions weren’t perfect, but we managed to figure out what to do. The dog door actually came with these plastic nails that you used to hold both sides of the dog door together. We did not trust the secure-ness of these, so we ended up drilling the top of the dog door into the wood with a real screw (just to be sure). 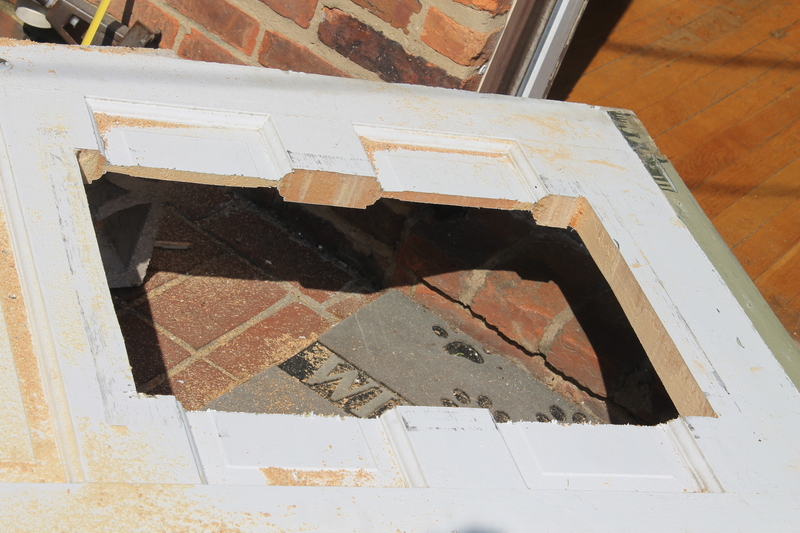 The template in the dog door box was used to measure how big a hole to cut in the door. We then got back to the hinges. We realized that we would have to remove the pins from the current hinges if we wanted to do things the “easy” way. In other words, we could try to hold the new door up in the air while attempting to screw in the original hinges, or we could remove the pins so we would have 1/2 of each hinge to screw onto the new door– and then we could hold the door up (for much less time) to put the pins back in. After assessing the pin situation, we decided that it would be really hard to get the pins out. Instead, we walked over to ACE (dog friendly!) and picked up three hinges which were the same size/shape (curved edge rectangles) as the original hinges. Then, all we had to do was screw these hinges onto the new door and then hold the door up long enough to screw in the other half of the hinge into the door frame where the original hinges had hung! 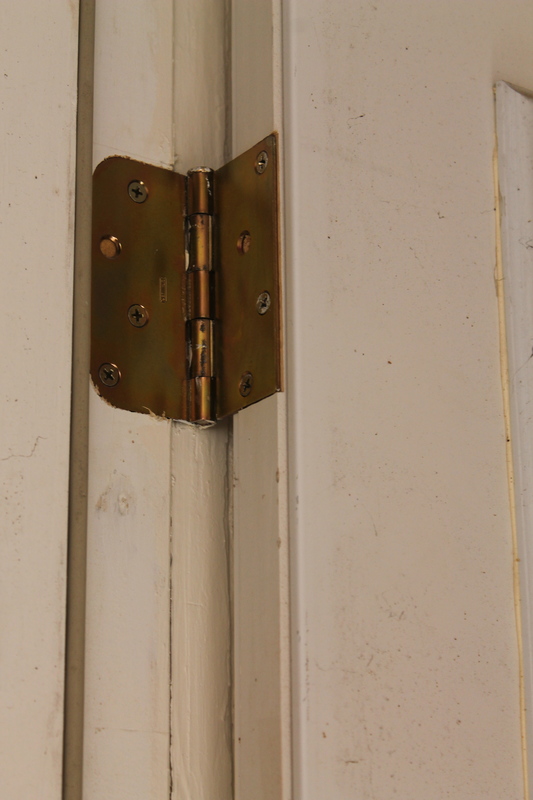 This may sound confusing… but basically these were the old hinges that we needed to match (below). The pin (in the center) wouldn’t come out, thus why we used new hinges instead of those already in place. We had to find hinges that matched these. Then, viola! We had a door with a dog door in it!!! We ended up spending around $180 for: dog door, door, drill, jig saw, screws, and new hinges. The door is now up and after a few hot dogs and a piece of cheese later, Franklin seems to understand the dog door! Now all we have to do is line up a dog walker and we’ll be golden! I did want to add here, that installing this dog door was not easy. It was fun, but in the heat we’ve been having lately, it was not brutal. It took probably longer than it should have, but 1) this was our first dog door installation, 2) we don’t have saw horses, we were propping the door on coolers and again the fence, etc., 3) we didn’t have the best tools in the world, we bought what we could on our budget and it worked perfectly for us. 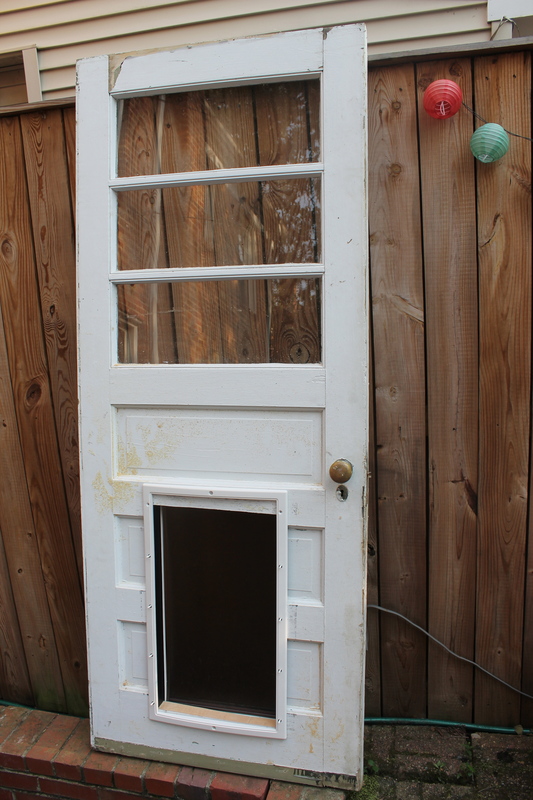 If you’re reading this, have you ever installed a dog door? 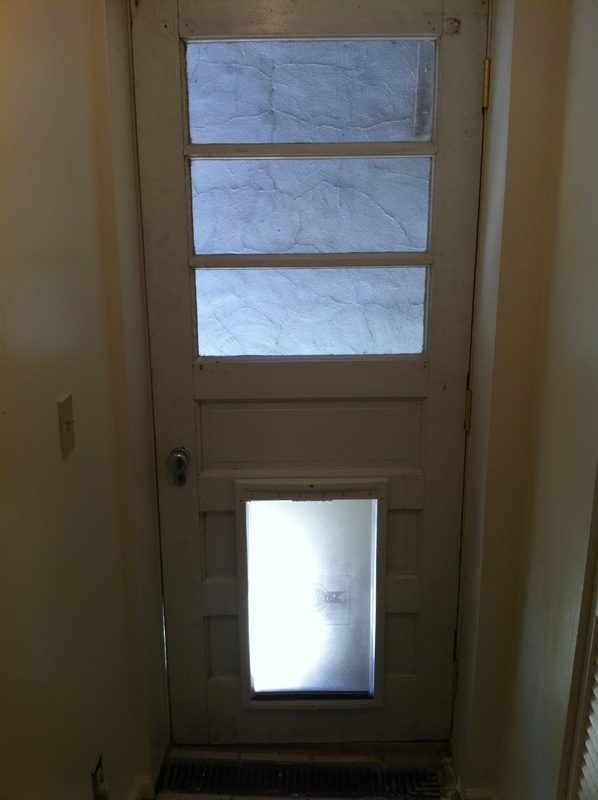 If you have, let me know your secrets to easy care-free dog door installing! Something that we have been talking about doing for the past two years is making our own spice blends/rubs/mixes. We have some plants to create a most excellent spice rack (more details later) and thus, we’d like to have some good blends to place on/in it. Last year we had a lot of success with oven drying chili peppers. 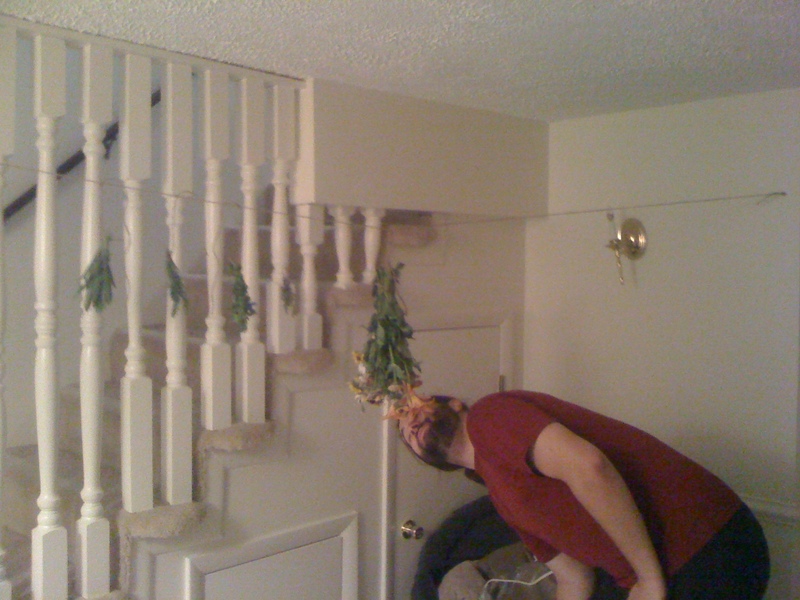 This year we wanted to dry some other herbs as well as chili peppers to see what we can come up with…thus was born, the basement herb line. Initially, I saw on Pinterest the idea of hanging an old wooden ladder as a drying wrack. While this looks so cool and someday I’d like to do it, I don’t have an old wooden ladder lying around nor did we have time this weekend to go rummaging through the local re-stores and other possible places that might sell old wooden ladders. Andrew suggested placing the line in the basement because it is dark, cool and there is a dehumidifier. Once again, he took the charge of actually putting up the line– so awesome! It’s very simple really- we have a piece of heavy duty twine hanging in the basement across one corner. 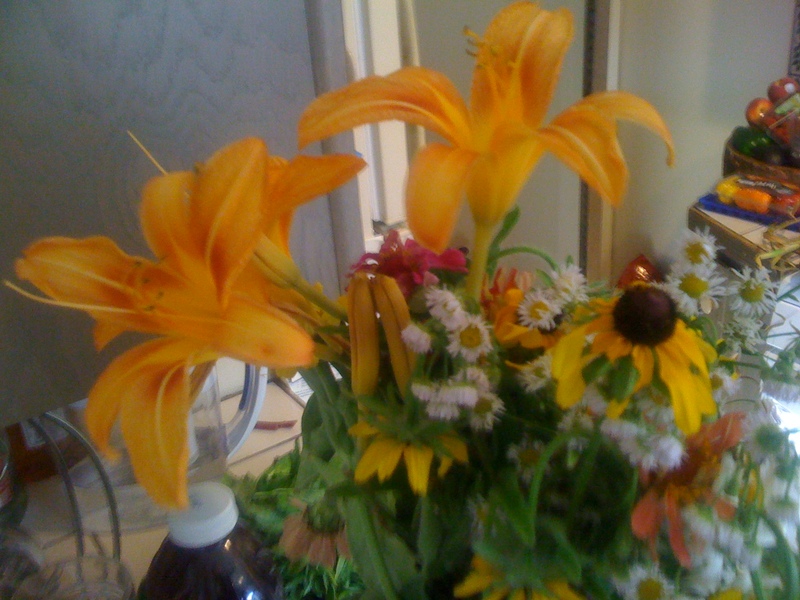 From it, I tied bunches of herbs that I picked at the farm last weekend as well as a bunch of flowers we also picked at the farm. Right now we have sage, rosemary, thyme, oregano, and flowers. Simple and effective. The flowers do seem to weigh the line down, we may need to rethink the design but for herbs, the line works perfectly! More on the spice blends we create later! Happy Monday, everyone! Last year, we lived on the fourth floor of medium-sized apartment building. We had a decent sized balcony with decent sun. Naturally, we really wanted to try and grow some veggies! My brother had a lot of luck with container growing in Indiana, so I figured we’d give it a try too. 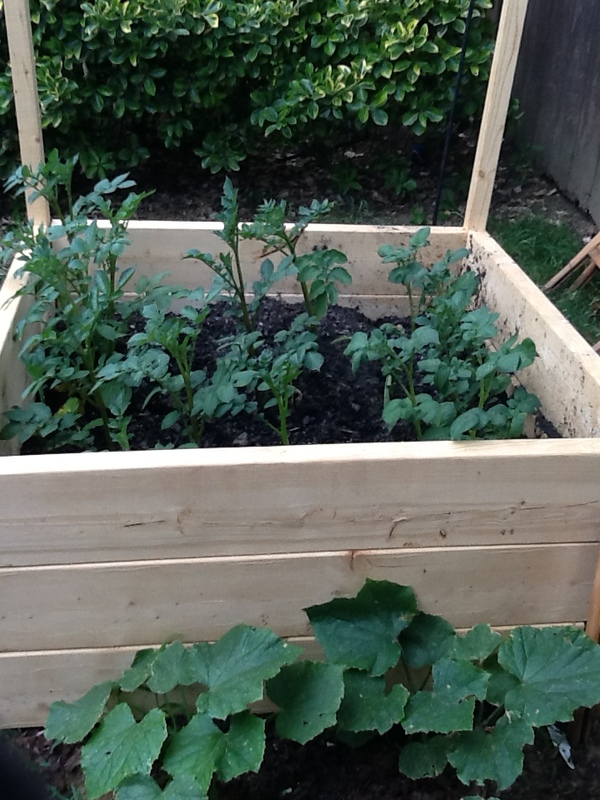 We bought a garden box (one of those large 3.5-4foot by 3.5-4foot squares. We placed it on a tarp and bought a bunch of dirt and planted a few different plants. The cilantro and the strawberries did pretty well and we even got some hot peppers. The tomatoes grew and grew and grew and then we ended up with one plant that had a lot of little orange tomatoes but that was it. Not a huge success, but still fun to try out. We also bought a large pot (think one for a fruit tree) and planted some seed potatoes from our CSA in it. I’ll be the first to admit that we hadn’t really done the proper research on the potatoes (we tend to be wing-it people on our first try with things). So, I read somewhere briefly while skimming that you should let the greens grow and grow and then die. When they die, it’s time to harvest. So, we followed those plans. Guess how many potatoes we harvested last year? Zero! Not even the seed potatoes were left! Oh well. Try again. So this year, I read a bit more about potatoes and spoke with some coworkers about potato boxes. 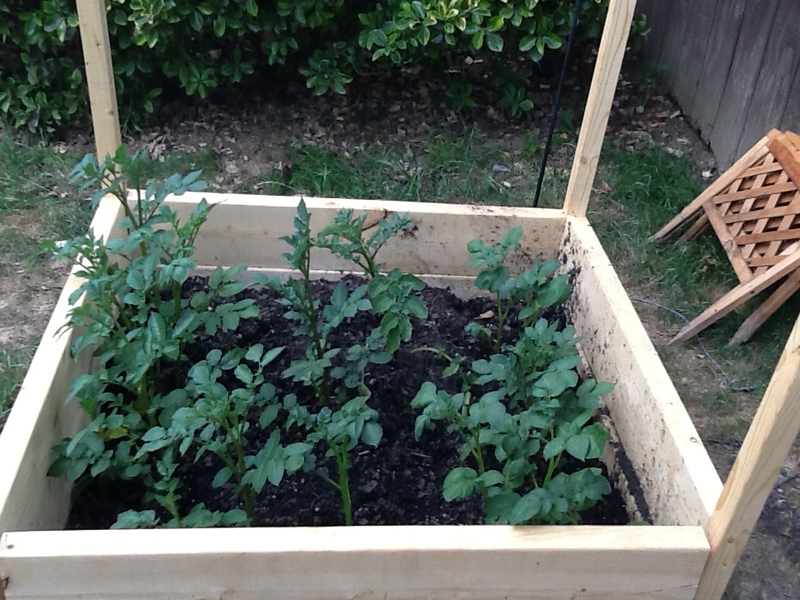 The idea is that you plant potatoes and then you build a box around them with walls that “grow” as the plants grow. The end result is that the potatoes grow up rather than down, so it’s much easier to harvest (and you’ll get potatoes :)). Here’s some more information on potato boxes if you’re interested. So, I was determined. A few weeks ago, we took a side trip to Lowe’s and bought two long 2×2’s each cut in half and then a bunch of 2×6’s cut in 32″ lengths (the measure worked around my plants). We ended up with 24- 32″ 2×6’s. I then grabbed some a wood screws and a more powerful drill (it was a grown up day) and headed home. 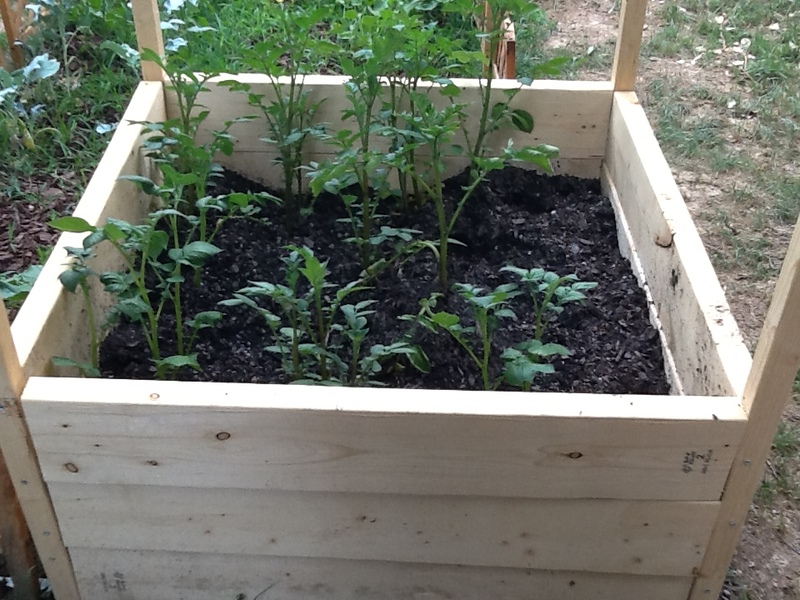 Once we created the first, bottom square we realized the plants were taller, so we added a second square of 2x6s. We then added a third. Next, you dump in enough soil to cover the majority of the potato plants (leave enough of the plant above so they keep growing). 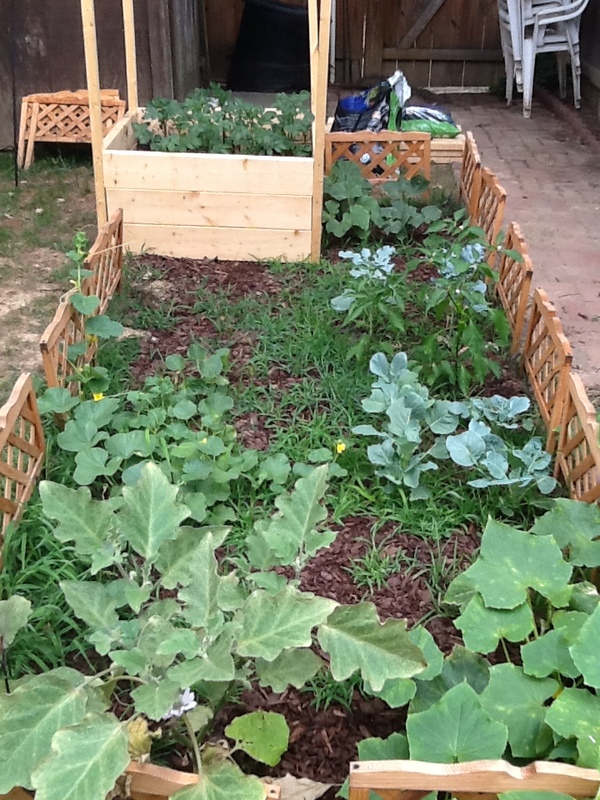 As they grow above the frame, you add additional square layers and dirt– right now we have enough for 6 squares.. if we need more, we’ll do so! As you can see in the above picture, we need to add another layer of 2x6s this weekend as the plants are all above the third layer.